Step 1: Initialize an instance of Presentation class. 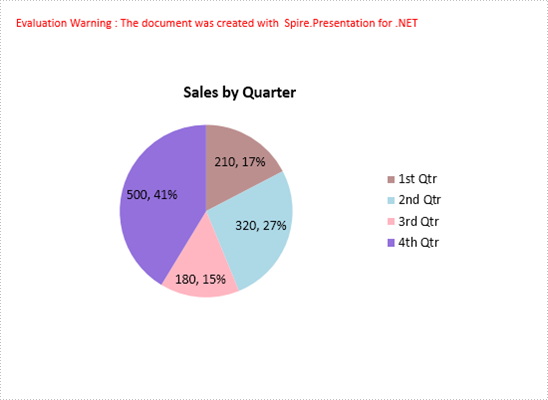 Step 2: Insert a Pie chart to the first slide by calling the AppendChart() method and set the chart title. Step 3: Define some data. Step 4: Append data to ChartData, which represents a data table where the chart data is stored. Step 5: Set category labels, series label and series data. Step 6: Add data points to series and fill each data point with different color. Step 7: Set the data labels to display label value and percentage value. Step 8: Save the file.